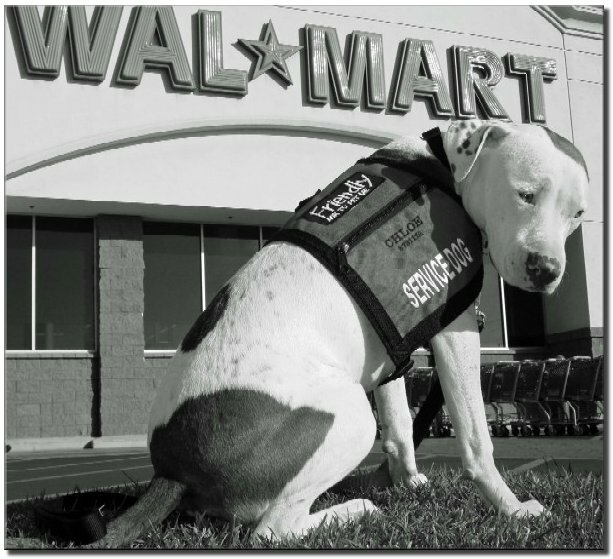 Pit Bulls: Service Dog Super Star? 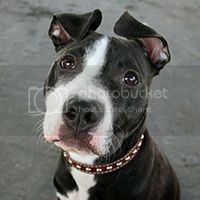 Public Service Announcement [to all who think I’m hating on these dogs or those who hate these dogs]: I am pro-APBT, but I am also pro-reality and pro-responsibility. I am all for promoting these dogs in a positive light, but unfortunately, there are individuals who are doing more damage than good even with their angelic intentions. 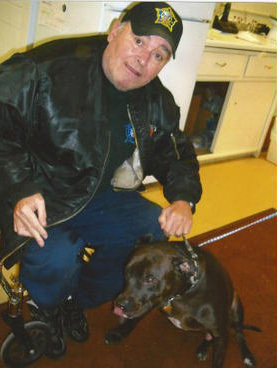 There has been an incredible rise in the popularity of pit bull-type dogs as service animals for individuals with physical or mental impairments. 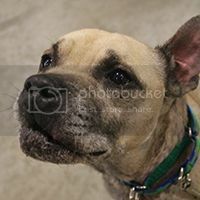 The rise has been so drastic that it has caught the attention of anti-bully breed aficionados as well. Is this rise in popularity for the good and betterment of the breed? 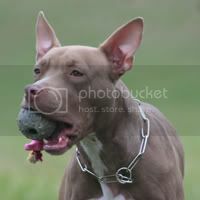 Personally, I’m really for it and I own and utilize an APBT for this very purpose and have done so for nearly seven years now (not a very common fact to many people unless they know me personally as I’m not always keen on talking about it). 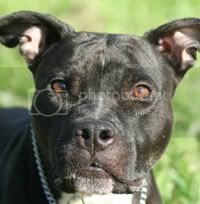 The APBT and other cross breeds and commonly labeled ‘pit bull’ breeds are in a league of their own. They are loyal, hard working dogs. They have all of the qualities and then some that would make them phenomenal service dogs for a variety of uses. They do, however, have their downfalls. It is, unfortunately, one of the biggest things that pro-APBT service dog people would rather be swept under the carpet to continue to promote this breed. Now, I’m not saying that these downfalls lessen the ability of these dogs to do work, but it requires that the person searching for the dog in question be realistic in realizing that breed traits may not always surface until the dog is well on the way to being trained and have to ‘change careers’ and retire from being a potential service dog. 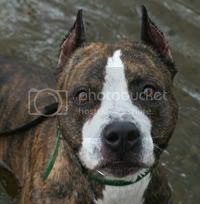 Not all dogs are meant to be service dog material and this is definitely not the exception for pit bulls either. One of my own personal reasons for being concerned for this breed’s rise in popularity in the service dog industry is that people are using this label to escape the consequences of having a banned breed in a BSL-ridden area. Some of these dogs aren’t being properly evaluated for the actual work being done, are being taught basic manners to respond in public and are not extensively worked specifically for servicing a disabled handler and for people to continually do this is a shame for the service dog community. Service dogs are supposed to be held to the highest level of responsibility and having a breed that doesn’t have the most phenomenal reputation means you take that reputation and double it. 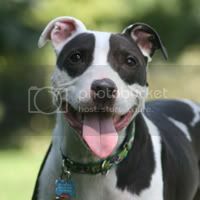 Ultimately, finding a pit bull-type dog that has all the aptitudes necessary for being a quality service animal is a rare find (and I know this from personal experience as my partner is going to be nine and we’ve finally branched out into looking at other breeds if we cannot find another pit bull-type dog). Does it mean they’re not out there? Absolutely not. They could be sitting in your local shelter or be the product of a responsibly bred litter. The main thing is, don’t get a pit bull to be a service dog because the dog ‘looks cool’ or whatever reason you want that is more ego-based than reason-based. When looking for a service dog, get a breed that fulfills your needs for independence and quality of life. 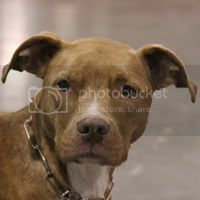 This entry was posted in General, Training and tagged ada, apbt, pit bull, service dog, training on March 31, 2012 by ShadowWolf.